The Tinkerer uses the power of science to control her enemies, summon robots, and provide healing support for her friends. Her well-rounded skillset makes her an excellent addition to any party. Girl genius, quackum enthusiast, time traveler—these are all perfect ways to describe the Tinkerer. She comes from 50 years in the future, a time when the heroes are all gone and Vestinel’s evil influence has corrupted the land. After her time machine crashes near Mana Ridge, she’s left stranded in the present with nothing to rely on but her wits and Alfredo, her giant robot butler. Now she’ll stop at nothing to save the Prophet and set right what once went wrong. The Engineer has a number of summons which aid her in dealing damage to her enemies. 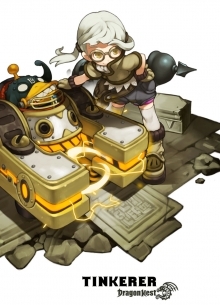 She can set down turrets, summon golems and other "pets" to damage enemies. She can also inflict debuffs. The Engineer has access to only Cannons. The Alchemist focuses on casting spells to both damage enemies or supporting her allies. She features a unique system of bubble/phantom management in order to cast spells. When casting a spell, she uses up a charge of bubbles/phantoms. The Alchemist has access to the Bubble Blaster.